White House Death Star Petition Wouldn't Pass New Threshold : The Two-Way In order to get an official response to your petition on the White House's We the People platform, you now need at least 100,000 signatures. Recent high-profile petitions haven't been all that serious. Eliciting an official response to your petition just got tougher. 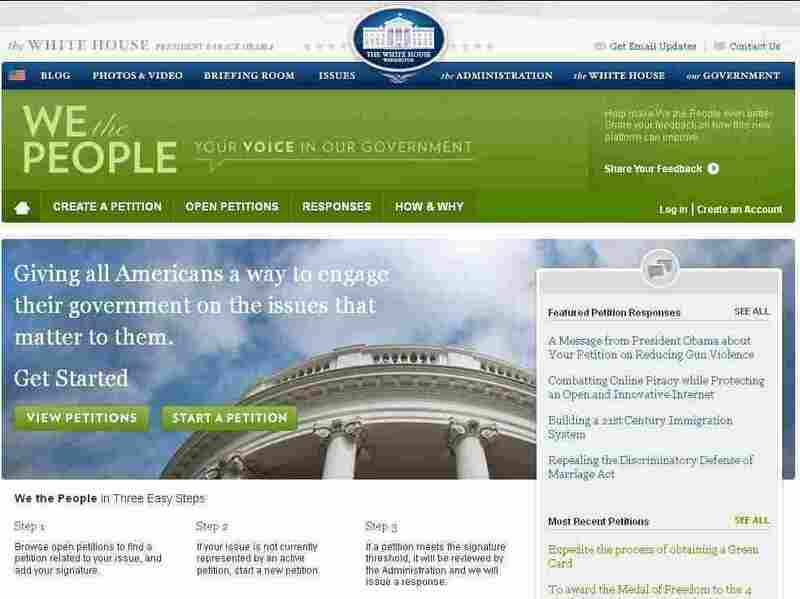 The White House now requires a petition on its We the People platform to get 100,000 signatures within 30 days in order to get an official response. When We the People went live in September 2011, a White House response only required 5,000 signatures in that time. Just a month later, that threshold bounced to 25,000. The most recent change is meant to "ensure we're able to continue to give the most popular ideas the time they deserve," writes Marcon Phillips, director of digital strategy. As we reported in December, the site "has become a hotbed of pro- and anti-gun sentiment in the wake of the Connecticut shootings, but many of those petitions have served essentially as vehicles to flog public figures who've waded into the heated debate." Blogger Jeff Jarvis created his own petition, writing, "If you'd like media to stop making fake stories out of fake petitions, sign below." Recent official responses include rejecting a petition that asks for the U.S. to build a Death Star by 2016 (the petition had 34,435 signatures). In the White House blog, Phillips says the use of We the People more than doubled in the last two months of 2012. As of Jan. 14, the White House reports, We the People has garnered nearly 9.2 million signatures and more than 5.4 million users. Searching petitions by popularity, the most signatures have gone to a petition to "Legally recognize Westboro Baptist Church as a hate group." Other top petitions include support for the mandatory labeling of genetically engineered foods, repealing Obamacare and repealing the Defense of Marriage Act.